While working on a new set of moffit designs for a Ski Sweater, I decided to include a pine cone in my winter scene on the chest area. To make the pine cone 3D, I used two tones of brown yarn, light brown for the tips of the seed and a darker brown for the inside portion. You can see the results below. Here is a photo of my “pine cone” bobble. It uses the two colors I mentioned. Unlike the normal method of making a bobble, each bobble is completed in one row and in one stitch. You can vary the size of your bobble by simply adding or subtracting the number of loops picked up in the base stitch. These bobble can also be made on knit or purl rows. The method I use for making the loops is K 1, YO, K 1; or P 1, YO, P 1. To make this bobble,using the light color, pull up the number of loops desired (I used 5 here, 3 loops allows more of the dark color to show through), leaving the original stitch on the left needle, bring the second color(dark) under the first (as in Intarsia) and knit in the back loop of the stitch. 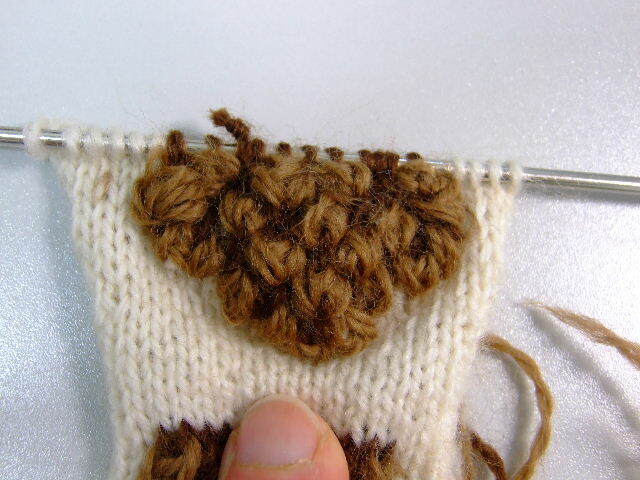 Next, using the tip of your left needle, lift all the light colored loops over the top of the dark colored stitch. Now, knit at least one dark stitch before you make another bobble. That’s it. By varying the stitches (dark color)between the bobbles you can create the appearance of the closed or open cone, as cones open in response to the moisture in the air. And.. in this case, at least, you are the weatherman. Experiment! Play a little!!! When my winter moffit set is complete I will let you know. It will be added to my “Patterns” page and will be available in my Etsy Shop. The moffit set will include a chart for the bottom edge of sweater and sleeves, using Fair Isle, an Intarsia design for the chest area, and an combo of Intarsia and Fair Isle for the shoulders and top of sleeves. I am very excited about it, and can’t wait to share it with you. In the photo above, I used my “Cable Chains” (see my tutorial) to create the stem and a (special) bobble to make the leaf. You will notice that the leaf bobble has been cabled to the right. Cabling this bobble to the right or left during the 6 row process allows you to shape the leaf anyway you want. Row 1 – Pick up 7 loops of green. 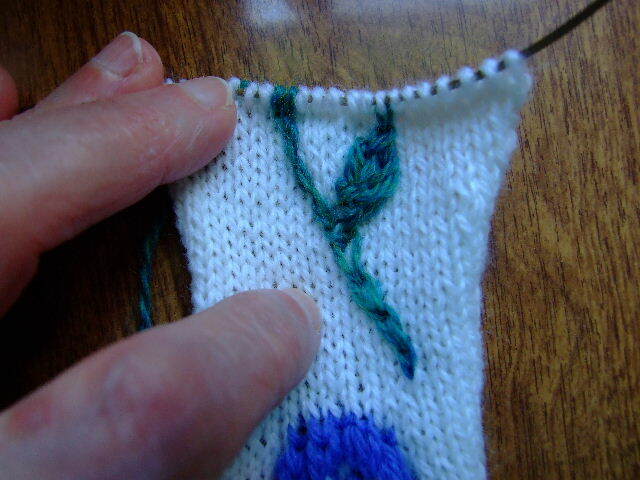 Row 2 – On the next purl row, slip all the green loops, cabling them in whatever direction you want your leaf to lie. Row 3 – Divide the bobble into 3 parts as follows: SSK 3 loops, K on loop, K 3tog. Finish row . Row 4 – Slip all loops (here again, cabling them in whatever direction you want this portion to go). Row 5 – Knit all three loops together. Row 6 – Slip the single leaf stitch left and cable leaf in whatever directions you want it to lean, and purl it with the background color. Make a swatch and try it. Once you get the hang of it, you can put them anywhere. The neat thing about the”bobble” is that you can vary the length of your loops, carry (or slip) them over more than one row to elongate them, divide them, as in the leaf above, and cable them to make various shapes. It is fun, and will peak your creative juices to find more ways to use them than I will describe here.